Amidst all the talk at SMB Digital about marketing solutions for SMBs, we also had a chance to hear from several leading edge SMBs themselves. 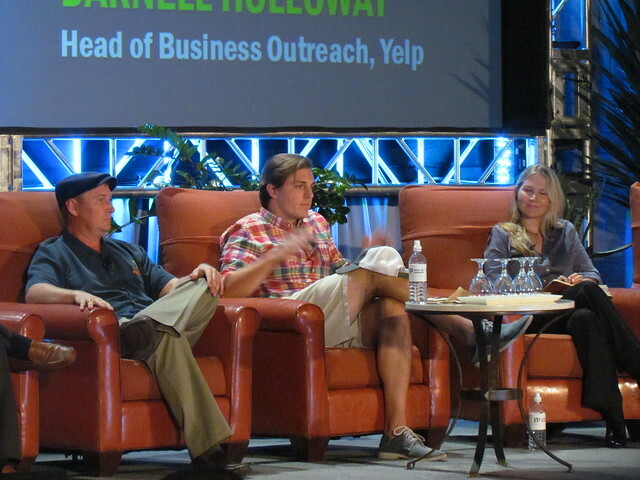 Several Yelp customers agreed to talk at the conference on Day 1, where they were joined by Yelp’s head of outreach Darnell Holloway. The session complemented a discussion by Ben & Jerry’s franchise committee head Hunter Rose and consultant Robyn Rose. Ann Webb, a skin care clinic owner, said she has relied extensively on Yelp, Living Social and Craig’s List to build her business. Yelp doubled my business in my first year, she said. Living Social helped her sell 400 deals recently and they’ve had frequent deals. While Groupon now comes calling, Living Social took a chance on her early on and has earned her loyalty, she says. Webb hasn’t yet figured out how to leverage online sales for her skin care products, however. Just one or two sales come from Amazon and other ecommerce sites, she noted, and it is an area she’d like to focus on more. Like Webb, Lombard also feels that he has conquered the heckler problem on Yelp. In his case, he does it by sending out customer surveys immediately after jobs are completed. The review system ranges from a Cow Bell on the high end to a Cow Patty on the low end. “I have found that people just want to be heard with either Yelp or Angie’s List. The customer community isn’t just made up of people you go to church with. It is about everybody,” he said. Hagebusch gives Yelp a lot of credit for his business success. “Without Yelp, I would be a one man operation, cleaning carpets all day,” he says.